Our pink HIPS 1.75mm and 3mm 3D printer filament for sale will easily create the perfect gift for loved ones. Pink 3D printing filament is perfect for girl’s rooms, Mother’s Day, or novelty gifts. Pink HIPS is a multi-use 3D printing filament: it can be used as supports for ABS or as a primary plastic. When soaked with Limonene, the material dissolves and leaves only the actual ABS print. 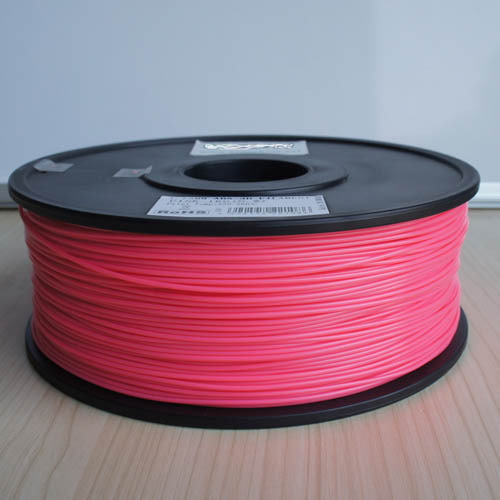 Our 1.75mm and 3mm pink HIPS 3D printing filament usually ships same day upon purchase. Pink High Impact Polystyrene (HIPS) is a versatile 3D printer filament to have on hand. HIPS is an impact resistant plastic and can be printed on its own or as a supports for ABS (very useful with dual-head printers). It can be dissolved when immersed with Limonene, making supports easy to remove post-print. HIPS filament is especially useful for creating large structures where supports are crucial. It typically shares the same strength and hardness properties as ABS. Storage Requirements: Store in an airtight container or bag at room temperature. HIPS will absorb moisture; thereby affecting the dimensional tolerances of your 3D printer filament. Use airtight storage containers, buckets, or zip lock bags to keep the material free from humidity. Compatibility: Our 1.75mm and 3mm pink High Impact Polystyrene 3D printing filament for sale is inspected, tested, and confirmed to work with all FDM (Fused Deposition Modeling) 3D printers. This includes popular brands such as Printrbot, Ultimaker, Afnia, Up!, Type A Machines, Solidoodle, Flashforge, Airwolf3D, Makergear, RepRap, and Makerbot (Replicator and Replicator 2). 3D Printing Helpful Hint: Experiment with temperature adjustments for optimal 3D printing. Keep a log that records the object you printed, temperature, resolution, and overall quality. This will help you gauge the proper temperature to use for future work. Color Fact: It is known that the color pink makes one crave sugar. If you have any questions regarding pink HIPS 3D printing filament for sale in either 1.75mm or 3mm diameter, please contact us.